Brazilian major mining group Vale extracts coal from the Moatize mine in the Tete province of Mozambique. In 2012, the board of Vale was planning a $6 billion expansion of the mine with plans to lift output from 11 million tons to 22 million tons per year. The company is planning to build a 600 MW thermal power plant at Moatize. Many families have been displaced. Hundreds of families, displaced by Vale Moatize coal mine in Mozambique, in 2012 blocked trains used by the Brazilian company, claiming it has failed to keep promises made to them over two years ago. About 700 families, resettled approximately 60 km away from the Moatize coal mining site, demonstrated against the lack of access to water, electricity and agricultural land at their resettlement area, Cateme. Tete Province, where these mines are located, is very rich in coal. It is expected to become the region's energy powerhouse built on coal and hydroelectricity. An estimated 23 billion tons of mostly untapped coal lies beneath Tete. However, local farmer communities have been on the losing side of the coal boom so far, especially since large scale resettlements forced them out from 2009 onwards. According to an article by EEB, "the list of companies includes Brazilian Vale S.A., British Rio Tinto, Australian Riversdale Resources Limited as well as Indian giant Jindal Steel and Power Limited that swarmed to the place with investments worth billions of dollars. Their extensive concession rights cover half the province. The more than 6 million ha they claim includes nearly all the grasslands that herdsmen from the region need access to." 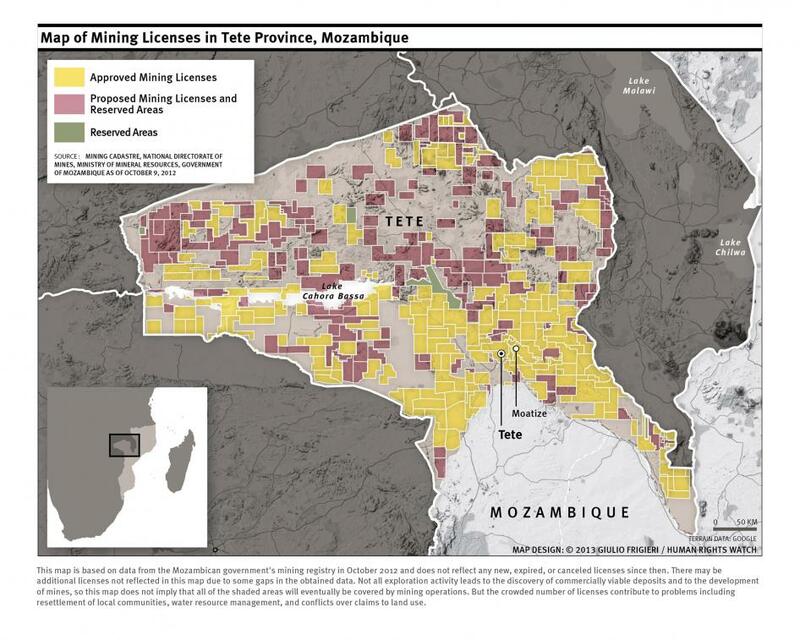 On July 13, 2017, "a citizen was reportedly shot dead by police in the village of Moatize, Tete province, when a group protested against the closing of Vale Mozambique mining company concession access gates. After lengthy talks between the local government and Vale Mozambique, it was conceded that the gates should remain open in order to allow the former owners to graze livestock and gather firewood, a witness told @Verdade. Allegedly, the deceased, Hussen Antonio, died fleeing from the police after being shot in the arm. Despite being already wounded, one of the officers called to the scene of the previously peaceful demonstration by Vale then shot the man in the back. Consequently, he fell dead. A Verdade tried to contact the police in Tete, but without success, since investigations into under what circumstances the deadly shooting happened were still ongoing. This is not the first time that Vale Mozambique has requested police intervention in conflicts with communities in the areas in which it operates, with sometimes dire consequences (1) (2). 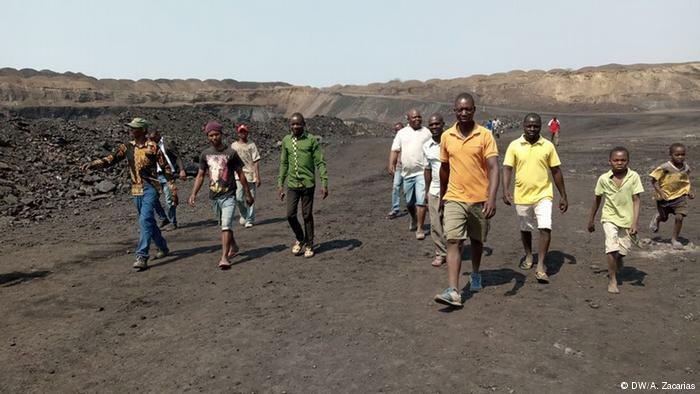 Hundreds of small farmers are still at odds with Vale Mozambique and also other coal extraction companies, and the Moatize local government, as a result of land grabbing and lack of compensation for having ceded their lands. Mozambique's Tete province comprises the inland Moatize coal mines and is a province very rich in coal. It is expected to become a very large energy power house, from coal and hydroelectricity. It is estimated that Tete holds around 23 billion tons of mostly untapped coal reserves. Although the coal boom is still in its early stages, Mozambique already surpassed Zimbabwe and became the second-largest coal producer in Africa, behind South Africa in 2012. The Mozambican coal production has increased from 42,000 short tons in 2010 to nearly 5.4 million short tons in 2012. Several new infrastructure projects related to coal production are planned as well, which include a new coal terminal at the Beira port, coal export terminals in Nacala and a new port at Macuse. Since 2009, a surge of foreign investment in Mozambique's coal sector has been taking place. Companies Vale, Rio Tinto, Riversdale and Jindal Steel from Brazil, UK, Australia and India have invested billions of dollars in the past decade and are expected to invest an additional 50 billion dollars in the coming 10 years. The local population of Tete province has suffered from the coal boom, since large scale resettlements have been taking place since 2009. As a consequence, the communities have faced disruptions in accessing food, water and work, as Human Rights Watch (HRW) reports. Living conditions have decreased drastically, as many farming households who had previously been living along a river and were therefore self-sufficient, have now been resettled to sites 40 km away from the markets in Moatize, with agricultural land of uneven quality and unreliable access to water. Food insecurity and dependence on food assistance provided by the mining companies has become a serious issue for the families. On 10 January 2012, an estimated 500 residents from the resettlement village Cateme from the company Vale took their frustration with the lack of response from the company to the streets, protested and blocked the railroad linking the coal mine to the port. The demonstrations were shut down violently by local police. About 700 families had been resettled to the Cateme area between November 2009 and December 2010 and had recently been suffering from a lack of access to water, electricity and agricultural land occurring due to the resettlement. In 2012, through interviews with 79 resettled and soon-to-be-resettled community members and 50 government officials, company representatives, civil society actors etc., HRW investigated the impact of the resettlement process on the communities. Their report indicated that the resettlements have had “negative impacts on community members' standard of living, including rights to food, water, and work”. It was found that residents were especially struggling to regain their former self-sufficiency. The resettlements that took place due to coal mining in Tete province cited in the report include 10 original villages (Chipanga, Bagamoyo, Mithete, Malabwe, Capanga, Benga, Nhambalualu, Cassoca, Xissica, Nhomadzinedzani) that had been and were to be resettled by companies Vale, Rio Tinto and Jindal Steel at the Moatize, Benga and Chirodzi mines. In August 2012, the government of Mozambique took steps to improve communities' protection during the resettlements by issuing a resettlement decree. Nevertheless, the government did not consult the affected communities during the development of the decree, therefore critical gaps still remain. As Kirschner and Powell state (2015, in Geoforum, in a paper on the Tete coals fields), "The Frelimo government—once guided by a Marxist–Leninist ideology—has come to view coal mining and export as a pathway to modernisation and development and has hitched its fortunes to the burgeoning demand for resources, including from Western countries and from the ‘rising powers’". In October 2018, neighbors of Moatize who lives along the fence of the company managed to shut down part of the Vale mine, known as "Moatize-2" . They “decided to invade the mining area, to have all [machinery] operators stopped by force, without however vandalising the machines,” reports the Association of Legal Support and Counselling to Communities [AAAJC – Associação de Apoio e Assistência Jurídica às Comunidades]. According to the same source, the population complains of excessive pollution, acceleration of the decay of houses due to explosion of dynamites, unbearable noise and dust pollution it was causing. The community complains for lung diseases other health impacts . 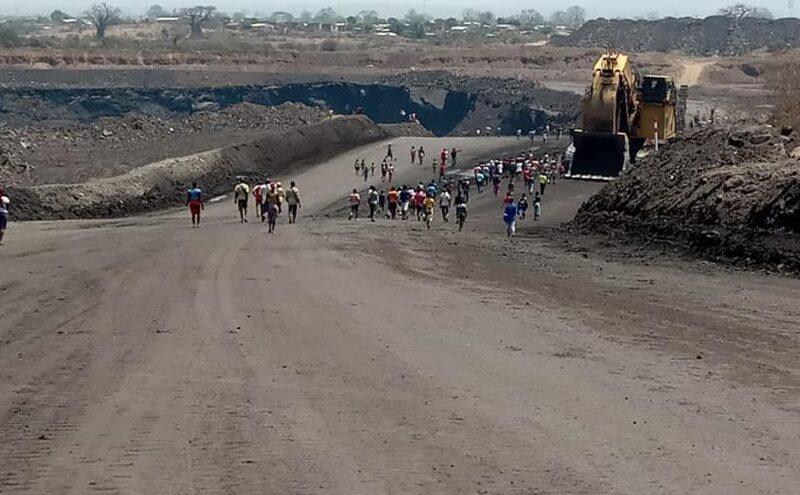 In November 2018, the Mozambican Bar Association (OAM) has again demanded that coal mining companies in the western province of Tete (in specific Vale Mozambique and the Indian firm Jindal) be held responsible for their failure to resettle people affected by their activities . The organization recognizes that Vale did resettle some of the communities affected by its Moatize mine, but that resettlement has always been vigorously contested as shoddy and unjust. The OAM points out that negotiations are continuing with the affected communities to ensure the payment of fair compensation. OAM also warns that to date the government has declined to use its authority. In particular, the organization accuses the Ministry of Land, Environment and Rural Development of "choosing to nourish the impunity of Vale and Jindal", which perpetuates "the precarious living conditions of the communities affected". Project Details Tete province is a "commodity extraction frontier" rich in coal. It holds an estimated 23 billion tons of mostly untapped coal reserves, with the natural resource boom still in its early stages. Mining concessions and exploration licenses approved by the government cover around 3.4 million hectares (34% of Tete province's area). When licenses pending approval are included, around 60% of the province's area are covered, representing a project area of around six million hectares of land. There are several plans for coal fired power plants, in thousands of megawatts. "... the province of Tete, once a remote outpost but now a hub of power generation for the southern African region and an emerging centre of global investment in coal extraction. Some of the world’s largest mining firms from both established and emerging economies have descended on Tete, investing billions of dollars in developing concessions to extract some of the world’s largest untapped coal reserves" (Kirschner and Power, 2015, Geoforum). In July 2014, Rio Tinto sold its coal assets in Mozambique to the Indian state-run International Coal Ventures (ICVL). Why? Explain briefly. By 2013, many of the resettled villagers and communities still felt misled and cheated by the outcomes of the resettlements which according to them, diverged significantly from what they had been promised. There also seems to still exist a lack of coherent, efficient complaint mechanisms, despite of the 2012 resettlement decree passed by the Mozambican government. There is police repression against people who want to use their own land which they have lost. (2)Conflitos entre mineradora e comunidades em Tete causam morte de jovem. Disputa de espaço entre a mineradora Vale Moçambique e a comunidade de Nhanchere, na vila de Moatize, resultou na morte de Hussen António Laitone, um jovem de 25 anos de idade. a range of civil society organisations.". Notice that much of electricity from Cahora Bassa goes to South Africa, is reimported by Mozambique, sold to Mozal for aluminium smelting that goes for export.